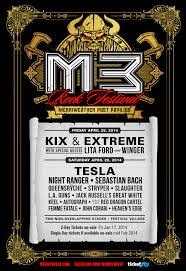 M3 Festival 2014 (Part #1).....Wonder if One of Those M's Stands For Meister? internet searching for my answers. 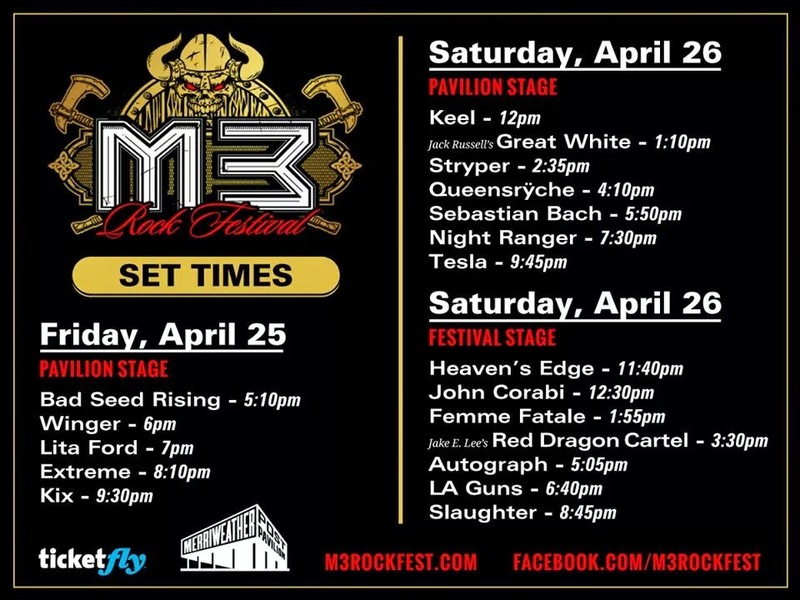 Why M3 is a wonderous little two day concert in Baltimore Maryland with some of my all time favorite and bucket list bands having appeared there over the past years. At the urging of some of my cruise friends who also attend M3 I threw caution to the wind and made the call to go. The morning that tickets went on sale I secured myself a single "best available" VIP ticket. My confirmation, emailed to me, showed what row and seat I was in. Hold on.....row and seat numbers?...isn't this a festival?? I was a little surprised and maybe weirded out by the seating at first but it all worked out very well once I was there. The second stage was general admission (as I would expect based on my previous festival experiences) and the main stage was similar to, for those of you here in Toronto, The Molson Ampitheatre only on a little smaller scale. This meant that I could get to the second (Festival) stage early for the chosen band I wanted to see and didn't have to leave the set early to rush for a close pole position on the main (Pavilion) stage which was nice. The second stage is situated over the hill at the back of the uncovered general admission lawn section. 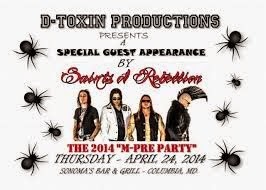 My first M3 event was the pre-party on the Thursday night at Sonoma's Bar & Grill presented by D-Toxin Productions. Awesome local Toronto band Diemonds played this event last year and it's too bad that they weren't on the bill again, but Black Tora were listed and something that I was highly anticipating. 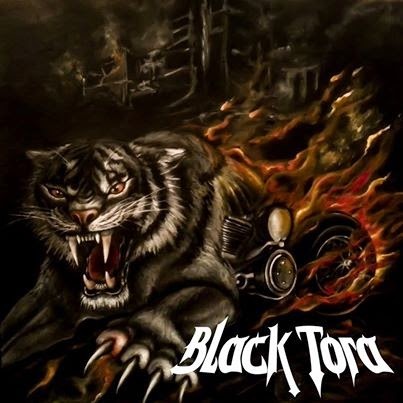 I'm not sure where or how I ended up with the 2009 Black Tora album Rise of the Tora way up here north of Toronto, but it is a revered particle of my vast music library. 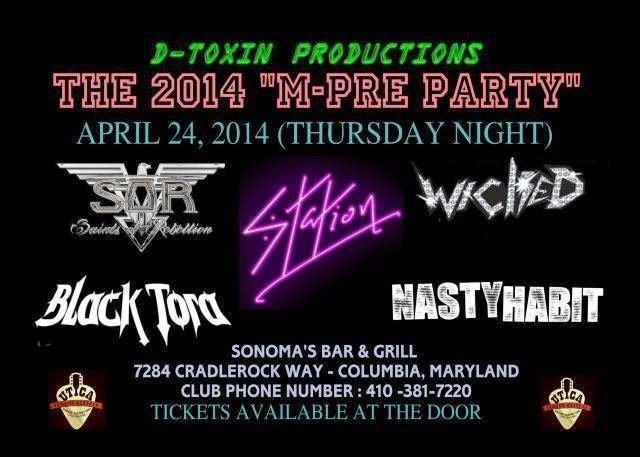 Rounding out the five bands on the itinerary for the evening were Saints of Rebellion, Nasty Habit, Wicked and Station. Saints of Rebellion I had seen at the Rockerz Gone Wild Pool Party II in Miami a few days before the Monsters of Rock Cruise, the rest I was unfamiliar with. The bar was smaller than I had expected, to put it perspective again for those from Toronto, smaller than Rockpile West. There was some merch for the bands set along the back wall next to the guy (Dave's Metal Magic Records) who was selling used CD's at a price of 5 for $20....better take a look see at his stock! Unfortunately my camera was not working and so I'm left with no photos for this occasion aside from a couple that were sent to me by friends. Saints of Rebellion were great at the Rockerz Gone Wild Pool Party II and were again here although from the section of the bar that I was in, off to the right side, the sound was a little muffled and dull as we were sort of hidden around a corner. The sound was much better as you moved in front of the stage more in line with the PA speakers. Never the less they were enjoyable and I look forward to some recorded material from them. Wicked graced the stage next from New York, New York. All sporting bleach blonde hair and a hugely glammy look, very Motley Crue somehow, they were also very good and had me hooked by the third and fourth song. Wicked's sound was a little more my traditional style as compared to the more modern sound of Saints of Rebellion and I hope there's some of Wicked's recorded material out there for purchase. Having come fully awake and once again feeling alive thanks to Black Tora's awesome set I was pumped for the next band, Nasty Habit. 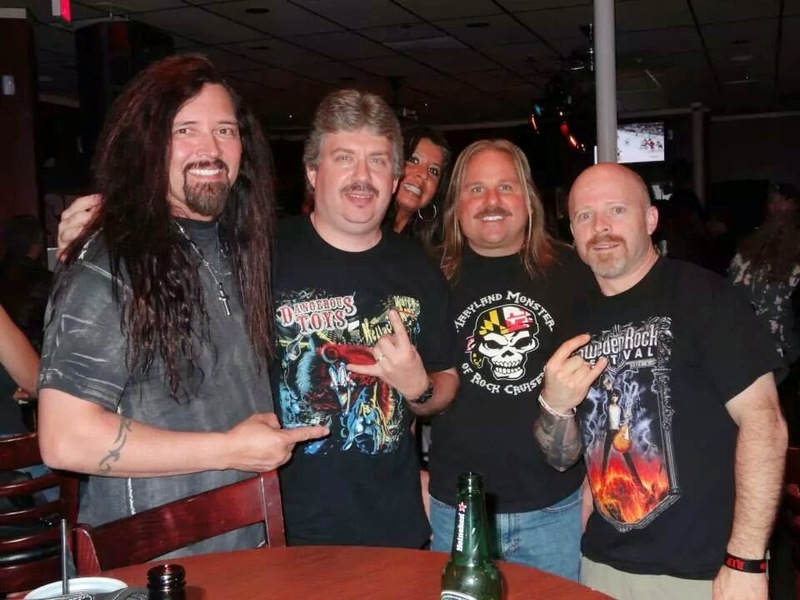 Shortly after I returned to the table Geno Arce, bassist for Keel, arrived with some friends. Having met Geno previously he shook my hand and checked out the tattoo progress (my full sleeve depicting a guitar case with the logos of about 30 of my favorite bands "stickered" on it, in which Keel does appear). Unfortunately my stupid camera was malfunctioning and so the photo of Geno pointing at the Keel name in my tattoo was lost, but I do have this group shot with some other friends. My friends and hotel mates were feeling the effects of the travel and decided to depart, but I elected to stay and cab it home later on. Nasty Habit took the stage and sounded good also possessing an 80's style. The drummer was sporting a Black Tora shirt which I though was rather cool and he was putting on a bit of a show, standing on his drums cheering on the crowd. Not to be outdone the vocalist spent some time in the crowd and on top of the bar at the back during one song. Definitely another band to search out and keep an eye on once I return home, but right now with my energy suddenly awash, I had trouble focusing on their full set and thought that I should have bailed with the rest of the gang. band I was totally unfamiliar with. Unfortunately I was to remain unfamiliar as by the time we completed the feed bag excursion, ran a couple of errands, parked and got into the park we completely missed them. The biggest issue now however was the steadily growing harder rain falling as we collected will call tickets and entered the gates. Amongst the food/beer stands and Merchandise booth that we passed heading towards the covered pavilion was, stretching up the hill a long line of soggy rockers. That's the VIP package pick up line I was told, which was split into three sections by thirds of the alphabet. Of course A-H was at least twice as long as the other two and where I needed to be, just my luck sometimes. However it turned out that my camera condescended to work today, but complained about the formatting of the card! At least I was able to capture a few photos. to "Pull Me Under", "Blind Revolution Mad", "Easy Come, Easy Go", "Rat Race", "Headed for a Heartbreak", "Can't Get Enough" and "Down Incognito". Yes that's how long I stood there with lukewarm rain pelting me and running down into my underwear, methinks a better system next year or had I known better I just would have picked up my package after the rain ceased! After braving the downpour I made it under the shelter of the pavilion in time for "Madeline" and "Seventeen", my two favorite Winger songs next to "Junkyard Dog". They had sounded decent out there, but even better in here and judging by the reactions of the crowd it was a great set. played the song when I saw her on 2013's Monsters of Rock Cruise. What did surprise me was that her vocals seemed a little "off" to me, like she was always struggling to catch up with the music. The actual surprise was revealed during the next selection of "Living Like a Runaway" when Runaways lead vocalist Cherie Currie joined the stage about half way through the song. Three Runaways songs came next with Cherie and Lita singing together for "Queens of Noise", "American Nights" and the sing along "Cherry Bomb" which had everyone in the crowd doing just that. During the whole Runaways segment I kept watching and waiting to see Joan Jett next on the heels of the photo of the three of them that was circulating social media just a couple of days ago, but it wasn't to be. The special guests were however not quite over for Lita's set, but before that we were all singing along to the hit duet originally recorded with Ozzy Osbourne, "Close My Eyes Forever". "Kiss Me Deadly" shut things down complete with Robert Mason, vocalist for Warrant entering about a minute into the song, hanging his jacket on a mike stand. I got the impression that it was not a planned/rehearsed event as Mason looked a little awkward and confused even erroneously dropping the mike at one point. Spotting a cruise friend, of which there are many here, I joined him and his wife in their box not far away from my stadium seat. I'm rather surprised at just how many people I know here at M3 and it's nice to see that I belong in this community. We enjoyed some beverages and caught up a little waiting for Extreme. I was looking forward to this set as I was a huge Extreme fan when they first issued the debut followed by Pornograffitti, but don't have much time for their subsequent efforts. I first became introduced to Extreme through the film Bill & Ted's Excellent Adventure when I purchased the soundtrack containing "Play With Me". Opening with "Decadence Dance"
directly followed by "Kid Ego", the whole band was sounding great. By "It ('s a Monster)" the memories were flooding back as I enjoyed a moment of reliving my youth in my head with all the Extreme concerts, getting them to autograph my vinyl copy of Extreme and the Pornograffitti VHS tape that I played so much I wore a hole through it. "Rest in Peace" was next and really isn't a bad song, however I began to lose interest during "Am I Ever Gonna Change", as I said I'm not a fan of the III Sides to Every Story album. My attention was instantly recaptured with the surprise that they were playing "Play With Me" next, I hadn't expected to hear it! Awesome song and they executed it really well although my neck would be rather sore for days to come afterwards. The stools were brought out now, signalling that it was time for "More Than Words" which was trailed by "Cupid's Dead" and the short instrumental "Flight of the Wounded Bumblebee". "Get the Funk Out" came next, but I could no longer wait and had some business to attend to so I listened as I headed out for the washrooms. Along the way I ran into a cruise friend from Brasil! Surprised at seeing each other we exchanged quick greetings and moved forward, I was back in position for the completion of "Get the Funk Out" and in time for the finale of "Hole Hearted" which had absolutely everyone on their feet singing along. The headliner KIX delivered a set to this "hometown" crowd that had them all on their feet, hanging on vocalist Steve Whiteman's every word. "Can't Stop the Show" started the event which saw KIX classics and staples such as "No Ring Around Rosie", "The Itch", "Girl Money", "Don't Close Your Eyes", "Rock & Roll Overdose", "Cold Blood" and "Blow My Fuse" all delight the audience. We also got a surprise, at least for me that I'd not heard in a live KIX show previously with "Body Talk" from the Cool Kids release. The awesome new track "Love Me With Your Top Down" from the forthcoming album , their first in something like nineteen years is an excellent composition holding true to the trademark KIX sound. KIX has never disappointed me in the times that I have seen them, in fact it was their infectious live performance that elevated me from "casual two album owning fan" to "rabid entire discography owning fan" on the inaugural Monsters of Rock Cruise in 2012. My hotel mates and I decided to take our leave after "Blow My Fuse" foregoing the encores to get a good spot at Clyde's, the bar that I'm told you HAVE to be at after the show. Clyde's was a great experience as well, totally packed with concert goers and artists all mingling together. I enjoyed some dinner while meeting new friends and chatting with old for a couple of hours after the day's events, but again the waves of exhaustion began to set in. I collected my belongings from the hotel room and moved residence to stay with my friend from Toronto who had just arrived today. Finally warm and dried out I was asleep quickly, knowing that tomorrow was another long, rock filled day.